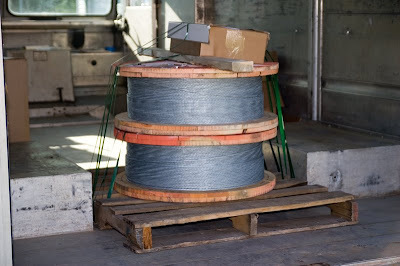 Gavin recieved delivery of the materials which include 800 feet of cable! We also have rebar, turnbuckles, connectors and who knows what else. I'll get a closer look tonight when I stop by to get started on the job. For now here's a picture. This is for a 50' x 100' hopyard. Three rows with 30 hops plants this year, but, we're building it so he can expand next year. where did you find poles for the trellis? are they untreated?